When I was little and living in Tuscaloosa, before the interstate came through, Hamm’s Pottery on Highway 11 just past Cottondale was a magical place on the road to Birmingham. I remember rows and rows of wheel-turned garden pots on the hillside outside the shop and a variety of pots – some made by Mr. Hamm and others mass manufactured – that were sold in the store by the highway. My Harbison grandparents liked to stop at Hamm’s and I suspect that some of the glazed decorative pottery for houseplants that I now have in my house came from those visits. Over time, Mr. and Mrs. Hamm passed away and a barbecue place named The Pottery Grill took over the location. 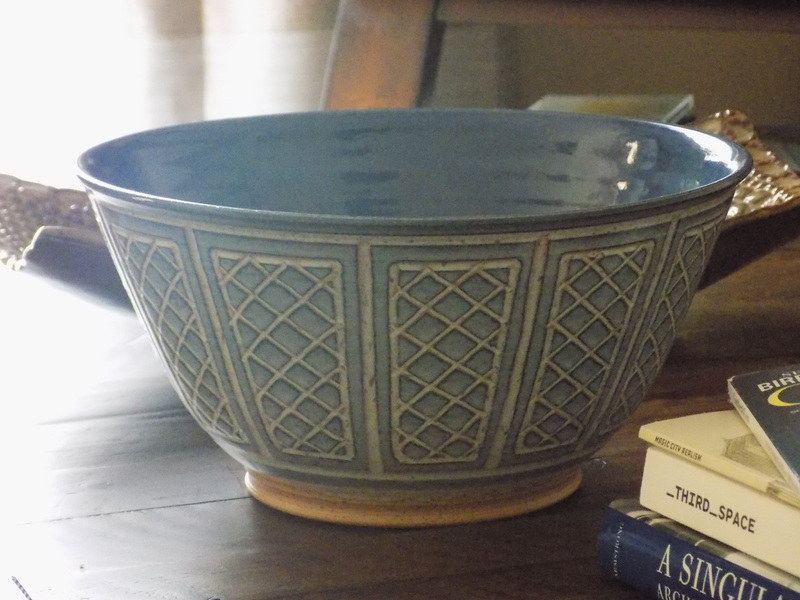 Fast forward to my post-college years and I was again living in Tuscaloosa and, influenced by the Kentuck Art Center and its fall festival, I began to take a collector’s interest in art and functional pottery. In every room of my house now, there is pottery to contemplate. My collection eventually outgrew the tables and shelves on which to display it. Just before I moved into my current house, I came into possession of my grandparents’ dining room table and china cabinet. Mother said she’d give me china to display in the cabinet but I had other ideas and the china cabinet became the home to a good many pieces of pottery. 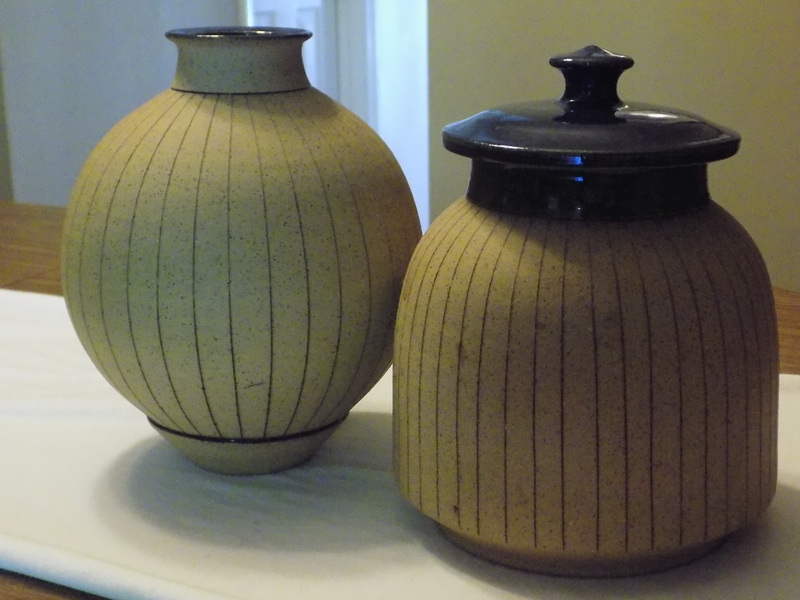 The first significant pieces of my pottery collection were a couple of “architectural” pots by Timothy Weber (www.tweberpottery.com) when he was based in Tuscaloosa. I lost track of Weber for a while when I was moving around for theatre and he had relocated to Tennessee. More recently, I have caught back up with him at the Kentuck Festival and other galleries around the region and have increased the Weber collection. 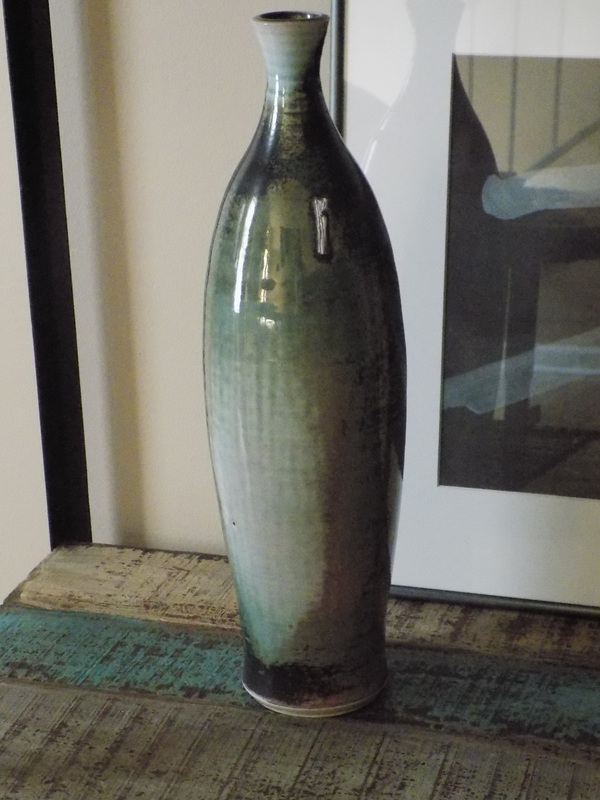 Daniel Livingston is a friend from my Tuscaloosa years whose delicate and intricate raku pieces have been added to my collection over the years. During a move, I dropped and broke one of my favorite Livingston pieces but gathered up the delicate shards and lined them around a plant in a flower pot. The piece took on a vibrant second life in that incarnation. 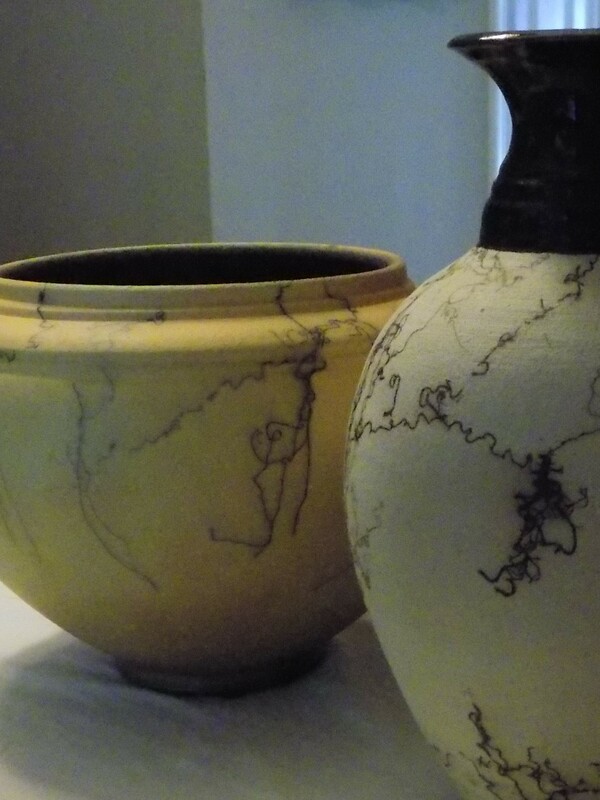 Susan Brown Freeman is still another potter with Tuscaloosa connections who is now based in Birmingham. I bought my first piece of her pottery at the Chimneyville Crafts Festival in Mississippi. Freeman’s deep glazes and intricate designs with delicately rendered reticulation and cutouts are favorites. When I purchased one as a present for my mother, it started her on a decades long habit of buying Freeman’s pieces. I went through a period of seeking out horsehair pottery – pottery that has horsehair thrown on it during firing, leaving a dark carbon stain on the piece. My two favorite horsehair pieces came from a shop in Seaside on the Florida Gulf coast and from a gallery in Little Rock. When I lived in southwestern Utah, I acquired pottery pieces that were fired in restored kilns of the ancient Anasazi by late 20th Century Native American potters. 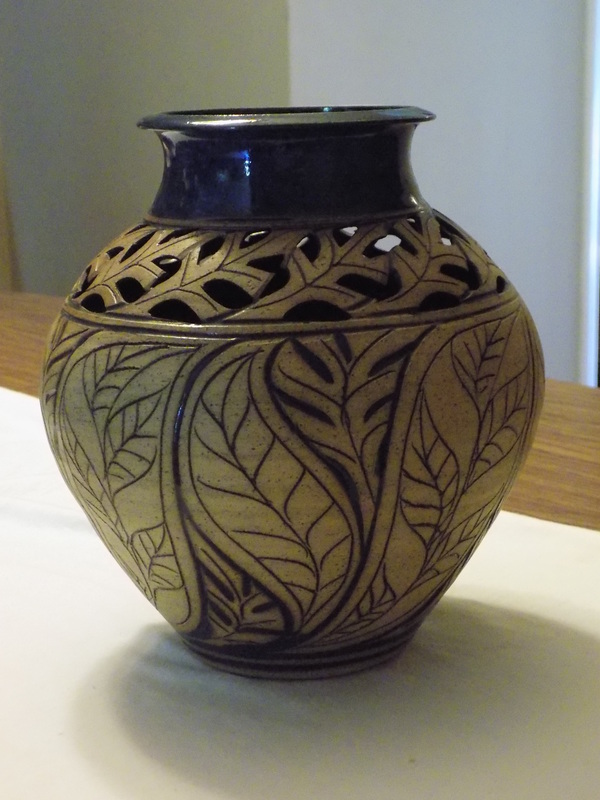 A Navajo-style wedding vase with two spouts bridged by a looped handle was a perfect wedding gift. On theatre gigs and tours, I would pack a piece of my pottery in my luggage. I would unpack and display it in each of the endless series of hotel rooms to keep a connection to home. On annual trips to Fairhope, I was pleased to discover The Kiln, Susie Bowman’s ceramics gallery and workshop (www.facebook.com/thekilnfairhope). In the early days of The Kiln, I was especially drawn to the pottery by Branan Mercer (www.b-metro.com/brananmercer) and usually bought a piece or two around Christmas. Ocean Springs, Mississippi, is a fairly short drive from Fairhope and its Shearwater Pottery (www.shearwaterpottery.com), started by Peter Anderson of the artistically prolific Anderson family, is an idyllic location along a wooded road perfumed by Gulf breezes. Over the years, my collection has grown with gifts from those who know my predilection. 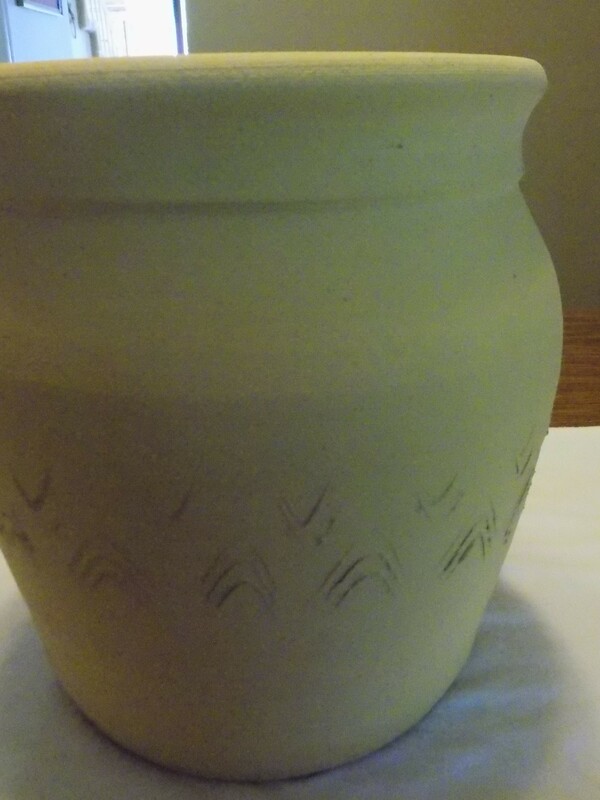 A Sansai Trinity Vase, a three-sided Japanese porcelain vase with Chinese characters, was a gift from Pratt Dean, a former missionary in Japan (www.trinityvase.com). A piece of speckled blue “Cindyware” by my friend Cindy Edwards is displayed near functional pieces by Jerry Brown, the master potter of Hamilton, Alabama, who passed away in 2016 (www.jerrybrownpottery.com). 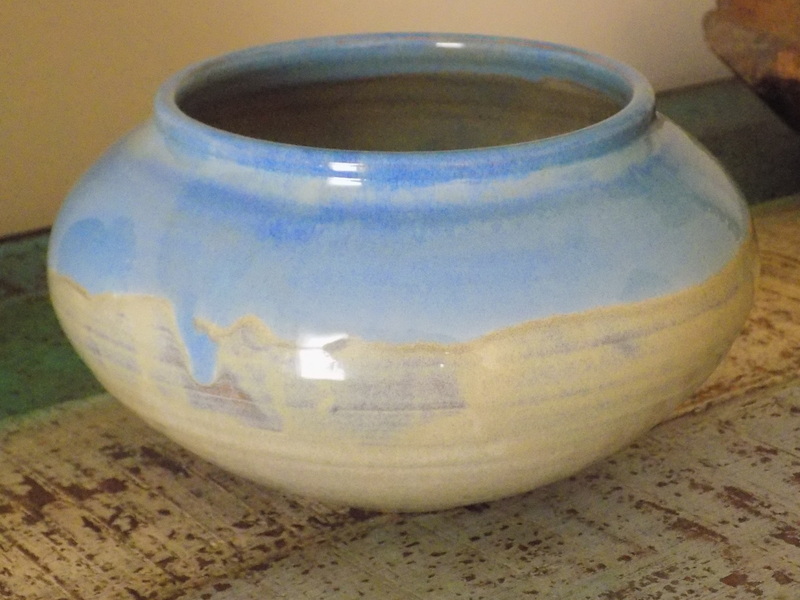 Jerry Brown Pottery is a family operation and Brown’s work was created in close collaboration with his wife, Sandra, and other family members. Brown is best known for his whimsical “face jugs,” which is a form I never warmed up to. I am more drawn to the functional pieces like bacon cookers and corn bread cookers which I own and use regularly. Miller’s Pottery in Brent, Alabama (www.encyclopediaofalabama.org/article/h-1033) continues a family tradition of stoneware pottery spanning the history of pottery-making in Alabama. 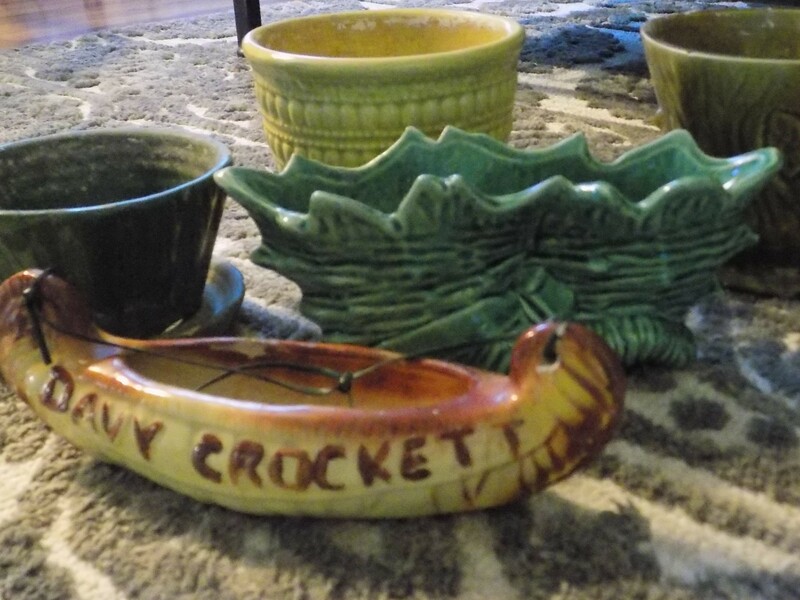 The Miller family has a marital connection to the pioneering French LaCoste family of potters around Montrose on Alabama’s Eastern Shore of Mobile Bay, whose kilns date back to around the 1840s. Eric Miller once told me a story about making a set of dinnerware for a relative who, upon receiving it, said, “This is so special, I would never dream of using it.” Mr. Miller sounded almost offended when he explained, “But I make it to be used.” I love the classic lines of Miller’s Pottery and the marks of individuals in the pottery. Eric Miller’s son, Steve, and his cousin, Allen Ham, each bring their own distinctive markings to the classic family designs. The Alabama artist Frank Fleming passed away in March 2018 (www.bhamnow.com/2018/03/19/frank-fleming). Fleming’s monumental works featuring fantastical animals are found in many public and museum locations throughout the South and nationally. His most notable work is probably “The Storyteller” fountain in Birmingham’s Five Points South district. 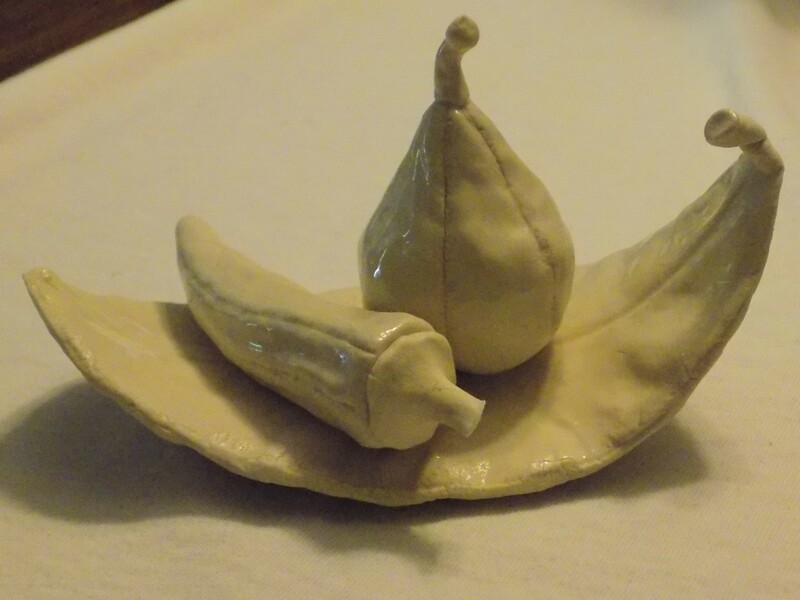 In my collection, Fleming is represented by a more prosaic miniature porcelain piece of an okra pod and garlic bulb resting on a magnolia leaf. 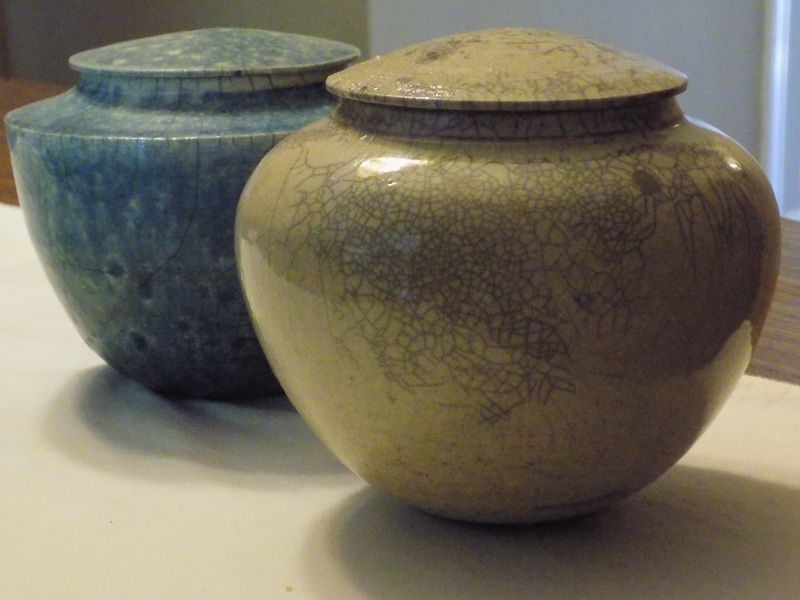 I have pottery pieces from many places but Alabama-based pottery is core to the collection. A key resource for information about pottery-making in Alabama is Joey Brackner’s comprehensive Alabama Folk Pottery (University of Alabama Press, 2006). This entry was posted in Pottery collecting and tagged Alabama Folk Pottery by Joey Brackner, Allen Ham Pottery, Anasazi Kiln Pottery, Branan Mercer Pottery, Cindy Edwards "Cindyware", Daniel Livingston Pottery, Eric Miller Pottery, Frank Fleming sculptor, Hamm's Pottery Alabama, Horsehair Pottery, Jerry Brown pottery, Kentuck Art Center and Festival, Miller's Pottery, Sansai Trinity Vase, Shearwater Pottery, Steve Miller Pottery, Susan Brown Freeman Pottery, Susie Bowman Pottery, The Kiln Gallery and Studio, Timothy Webber Pottery on May 28, 2018 by gedwardjourney. I never know what will catch my eye at the Kentuck Festival of the Arts in Northport, Alabama, right across the Black Warrior River from Tuscaloosa. It is always held on the third weekend in October (www.kentuck.org). The festival started on a small local scale in 1971 and has grown in size and reputation ever since, frequently and nationally being touted as among the finest of its kind. Folk, self-taught, and visionary artists have always been the backbone of the Kentuck Festival but it includes a diverse and impressive array of visual artists from the South, throughout the United States, and beyond. 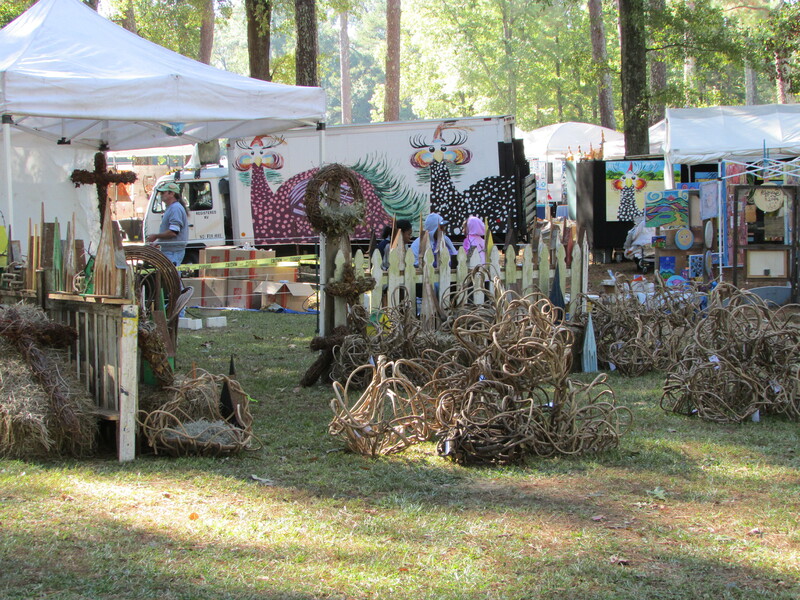 The festival takes place in a wooded area of a park not far from Northport’s downtown but the Kentuck organization operates year-round with resident artists, studios, galleries, and workshops spread along Main Street and throughout the city. Everything builds to the festival. Artists, dealers, patrons, and sightseers converge from all over the country to purchase, mingle, look at art, and meet the artists. Demonstrations, musical performances, storytellers, and food areas round out the sensory overload of the event. I counted more than 250 artist exhibitors in booths spread among towering trees. An added bonus was when I stumbled upon an art installation in an environment adjacent to the Festival grounds. Meredith Randall Knight’s M.F.A. exhibition, “The Marrow of It,” features nebulous concrete abstractions nestled within and interacting with a natural environment just steps from the festival. The sense of community is palpable and is one of the factors that always brings me back. Kentuck gives me an opportunity to visit with friends – many of whom I only see annually at Kentuck and some of whom I have known since I was an undergraduate at Alabama in the ‘70s. I can check out new directions in their art, find out how the art circuit has been this year, and catch up on the family. Among those friends I count on seeing are Lou and Daniel Livingston. It’s always good to see Daniel’s bold works in clay, bright and shiny and delicate. Tim Weber, whose work I’ve followed and collected since he was in residence at Kentuck, is constantly creating new forms in his clay work as well as revisiting and fine tuning forms that he has been doing throughout his career. Close by Daniel Livingston’s area are Andrew and Etta McCall and their lovely little church structures and bird houses and free-form baskets. T.R. Reid keeps creating whimsical and original whirligigs while his partner, Jeanie Holland, displays her colorful mixed media wares one booth over. Folk pottery legend Jerry Brown has his face jugs on display among the exhibitors and the Miller family from Miller’s Pottery in Brent, Alabama, throws pieces as patrons look on. 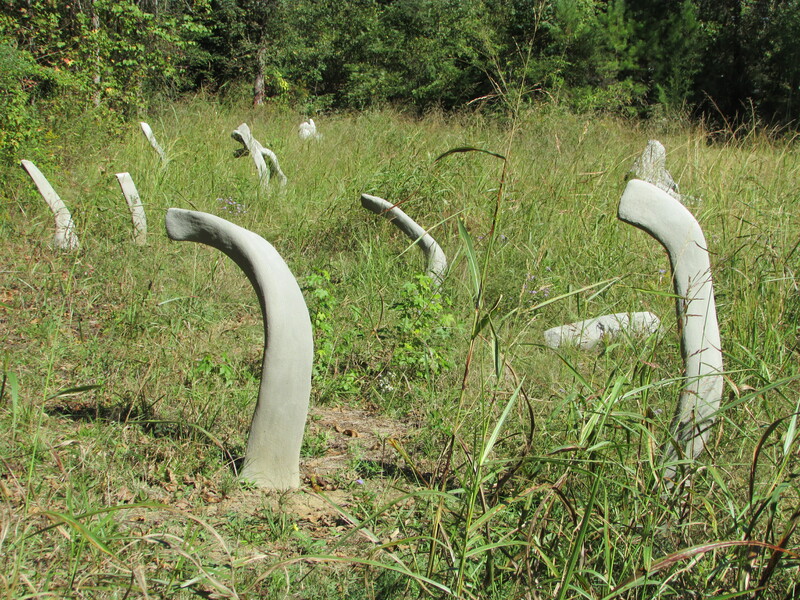 The Millers have roots going back to the early days of Alabama potteries. I have pieces by all of the aforementioned artists in my home and living with their art is made even more special by knowing and interacting with the artists. Most of my pieces were purchased directly from the maker. Charlie Lucas, the “Tin Man” and a legend in his own right, seems always to be hard at work on new sculptures in the rusting metal enclosure that houses his work at the festival. Steve Shepard’s outspoken and brightly colored paintings, often sprinkled with his unharnessed opinions on politics and other issues, are as entertaining as the animated conversations with the artist himself. 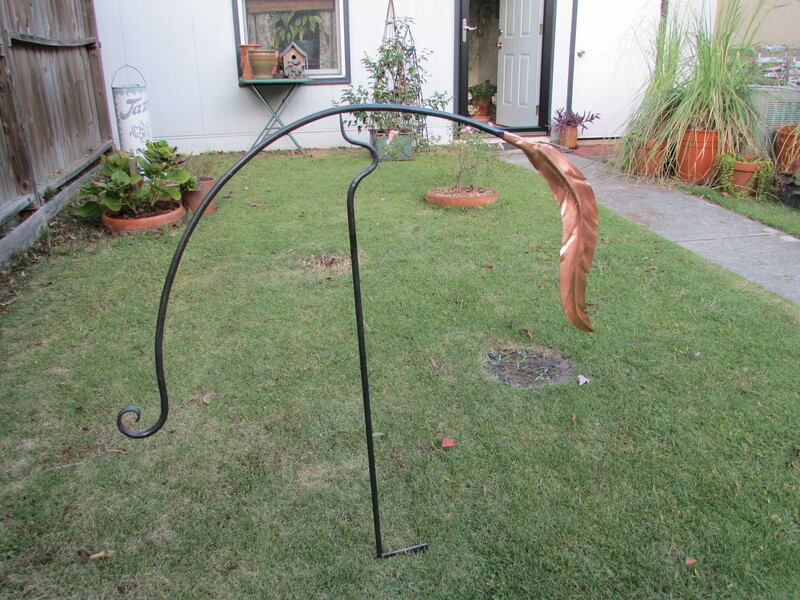 My main purchase this year was a copper and steel balanced wind vane by Allan Kress of the Alabama Forge Council. The finely wrought copper feather moves wistfully, dancing delicately with the breeze. I never know what will catch my eye at Kentuck and I never know, until I’m there, what I’ll be bringing home. For one weekend in October, a community of artists in Northport, Alabama, supplies positive and creative energy that will sustain and inspire me in the days to come. This entry was posted in art, culture, Kentuck Festival of the Arts and tagged Alabama, Alabama Forge Council, Allan Kress, Amos Paul Kennedy, Andrew and Etta McCall, art, Charlie Lucas, Clay Bush, culture, Daniel Livingston, folk art, Jeanie Holland, Jerry Brown pottery, Kentuck, Meredith Randall Knight, Miller's Pottery, Northport, Steve Shepard, T.R. Reid on October 21, 2014 by gedwardjourney.